On 1 June, Transport for London (TfL) took over a swathe of lines on commuter routes which were previously run by Abellio Greater Anglia. You may remember that back in 2012, London mayor Boris Johnson published his Rail Vision report which outlined a slightly more ambitious proposal to take over rail routes in the north east and south east. The Department for Transport decided to let TfL have a shot at running the ones in the north east and lo, everything turned orange and started appearing on an increasingly crowded tube map. 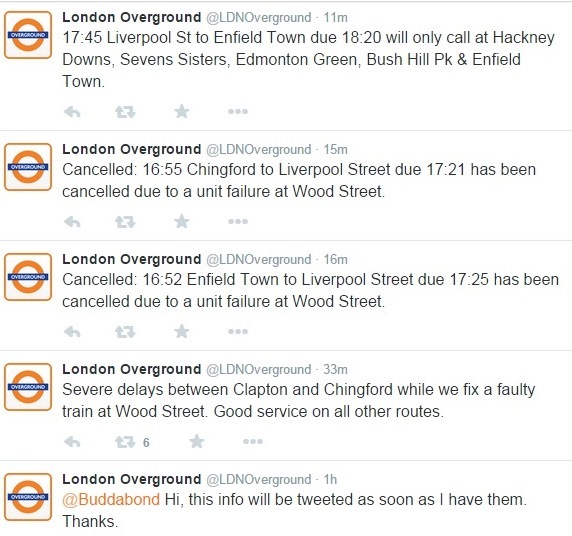 So how’s it been going for Chingford’s commuters? Not too well, it turns out. KA-POW! The 17:18 will also be skipping virtually every stop on the line. Don’t live in Walthamstow or Chingford? Tough s***. F*** you! The 16:18 to Chingford will be delayed for ages yet still not quite long enough for you to be entitled to an actual refund. Another resident used the medium of song to communicate her dissatisfaction in a genius reworking of that 90s classic by D:Ream ‘Things Can Only Get Better’. Yesterday’s service wasn’t looking a whole lot better either — a surefire way to infuriate commuters on one of the hottest days of the year is to get between them and a cold beer at home. In case you were wondering if the Enfield line’s passengers had got a better service, they didn’t, with delays on the first 11 days of running. Commuters branded it a ‘farce’. Just 89.9% of trains have run on time in the last month. “The standard of service on the Lines recently taken over by London Overground has fallen to a level beyond unacceptable. As commuters we are outraged by the drop in service the moment that TfL took over. We feel the need to remind TfL that commuters have responsibilities at work or simply need to get to get to their destination. “Particularly, the Chingford to Liverpool Street Service has suffered disruption, however, Enfield to Liverpool Street is suffering too. Fares haven’t yet gone up, but it’s likely they will after a review by TfL a few months down the line. Get ready for a new round of complaints when that happens. The @TfLChingford Twitter account hasn’t actually been taken down, it’s just on hiatus for a while. I’ll probably bring it back at some point when I’m less busy. Good to hear! I assumed you’d been compelled to take it down.